Food trucks are now in their glorious days. They are invading pop-up market everywhere, but also hitting the road, finding strategic place to settle for hours on lunch or dinner time only. In this temporary business era, big food truck with all new, big, and complex ranges of commercial equipment seems fancy and tempting for its durability. However, sometimes it indeed looks too big and bulky. Making food truck with VW Kombi is a choice that many business owners opt for. VW Kombi food trucks look simple and efficient. They are also blessed with their unique and retro appearance. On top of that, more point for their small capital needs. However, we also have to deal with their limited space. We may not have big ranges of products to sell in this small-spaced business field. Selling cakes is fine, coffee-shop is fine, even making grilled food with outdoor barbecue stove is still fine, but selling food with big menu is complicated and not recommended. Andi A. Luthfi, an owner of Pvolks VW workshop in Bandung, said that there are many limitations in making a food truck out of a VW Kombi. Cooking inside the VW Kombi is not recommended because of its small space and low ceiling. Thus, a food business still has to fully depend on the central kitchen. “If you insist to cook, we can use additional tents. You can bring your additional equipment and cook in the venue,” he said. Richard Myrick, Editor-in-Chief of Mobile Cuisine also testified that notion with saying that there will also be some hard decisions in determining what equipment a food truck should have. “If you need assorted kitchen equipment, you may want to use a food truck or full-slide trailer. The more sales you intend to make on a daily basis, the more storage space you need. Smaller platforms, can sell as much as a food truck or trailer; however, you may need to make multiple trips to your kitchen to keep yourself stocked to meet your sales needs,” said him. 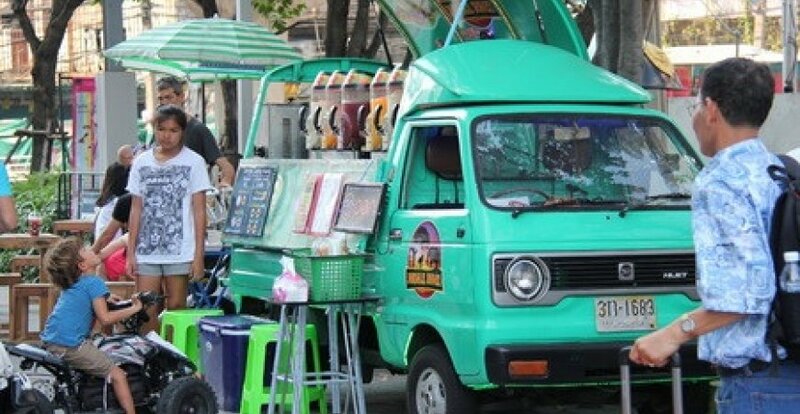 The key equipment needed for VW Kombi food truck, according to Luthfi, is only holding cabinet or warmer, refrigerator, coffee machine if needed, and beverages dispenser. “Almost all of them can be built-in. Warmer can be built-in in the back of the VW. Below that, we can install a generator. Coffee machine can also be built-in near the window so it is easier to serve customer. Installing a panel on the window to form a table for cashier when it is opened is also recommended. The goal is creating good flow in this small kitchen,” said Luthfi. He also added some tips to make VW Kombi food truck more appropriate, thus more comfortable. To make interior more airy, ceiling can be elevated. To make ambiance near the food truck nicer, we can also choose quieter generator. The last but not least, installing good drainage system is a must for every food truck.